When first installed, WP Simple Pay is set to Test mode by design. We highly recommend staying in test mode until your payment forms are ready and you’ve looked through test transactions in Stripe. While in Test mode you can use any number of test card numbers and payment methods provided by Stripe. 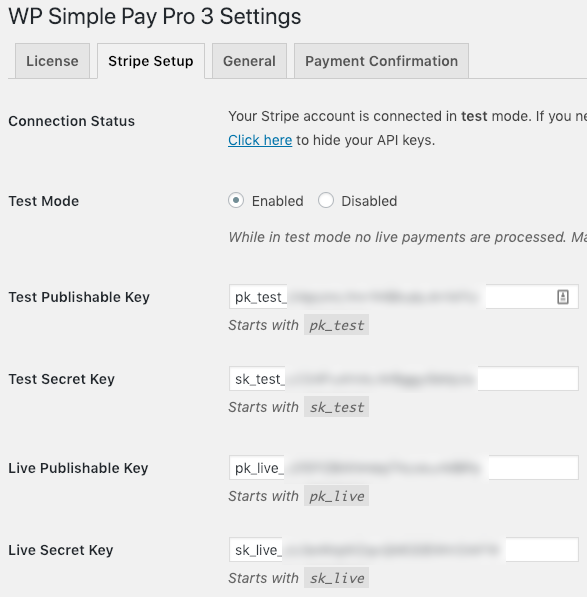 To make sure WP Simple Pay is in Test mode, first log in to your WordPress admin and go to Simple Pay Pro → Settings → Stripe Setup. Here you can toggle Test mode on and off. Then click Save Changes. If you’re not connected to Stripe, see Connecting your Stripe Account. If preferred, you can manage your Stripe API keys manually following the link in the settings, which will look something like this. While viewing your WordPress admin in Test mode, you should see an indicator in the top right. On the public side, you should see a yellow “Test Mode” badge next to your payment buttons. Stripe isn’t exclusively in test or live mode at any given point in time. Instead, Stripe stores test and live transactions and other data completely separate from each other. To view test transactions in your Stripe dashboard, simply toggle the View Test Data switch in the menu on (text should become orange). You should also see an orange Test Data indicator at the top of all screens while viewing test transactions. Note that Stripe subscription plans and coupons are also kept separate between test and live data. Before you make the switch to Live mode in WP Simple Pay, you may need to re-create plans and coupons in your Stripe dashboard while viewing live data. Finally, make sure you review Stripe’s Going Live Checklist before disabling test mode.